For National Football Authority, we break down the effects of the Saints bounty suspensions. 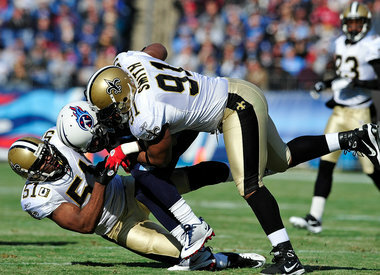 How will the Saints go on without linebacker Jonathan Vilma and defensive end Will Smith? How will the Packers adjust without defensive tackle Anthony Hargrove? And what about the Browns and Scott Fujita? Click here to read all about it. Giants physically dominate Falcons; will recipe work vs. Packers? For National Football Authority, we break down how the New York Giants beat the Atlanta Falcons by getting physical. Then we analyze whether the Giants can repeat the formula when they travel to Green Bay this weekend. Click here to read all about it. Each week, we compare all 32 NFL teams using our Football Relativity comparison. On the comparison, the 10 level is reserved for the best teams, and the 1 level for the worst. Normally, we note throughout where teams have moved up or down from last week. We will do so this week, but we will discuss only the 8 remaining playoff teams. 10 – Green Bay Packers – The Packers made it through the bye week, and they should get WR Greg Jennings back in the lineup this week. That will help, but their matchup against the New York Giants is a tricky one. The Packers’ lines (on both sides of the ball) must do their job and keep the Giants from manhandling them the way they manhandled the Falcons on Sunday. 9 – Baltimore Ravens, New Orleans Saints – The Ravens, who were on bye, will face the Houston Texans. Their defense has to be licking its chops at the thought of taking on a rookie quarterback on the road. The Saints overcame an early deficit and thrashed the Lions 45-28. Once again, the Saints’ elite offense shined through, and once they got a lead they played from ahead as well as anyone in the league. They face a much trickier matchup this week at San Francisco, because the 49ers have an elite defense. 8 – New England Patriots – The Patriots dodged the Pittsburgh Steelers and instead will come off their bye against the Denver Broncos. Their 41-23 win in Denver a few weeks back looms large in that matchup, no matter how much magic Tim Tebow came up with on Sunday. 7 – San Francisco 49ers – The Niners come off their bye with the matchup everyone expected against the Saints. Getting New Orleans at home will help, but San Francisco must solve its red-zone problems and score touchdowns to have a shot. We are skeptical that San Francisco will score enough points to do so, even if they hold the Saints to 24 points or less. 5 – New York Giants – The Giants put on a vintage performance in dominating the Falcons 24-2. As we said throughout last week, the Giants are finally getting healthy, and that allowed both lines to control the game vs. Atlanta. That gives them a chance against a Packers team that they nearly beat late in the season. But we still don’t see the Giants winning a shootout in Green Bay – which means they need to turn the game into a slugfest. If they can do that, they have a chance. Still, despite the fact that the Giants haven’t played this well all season, we don’t see them being good enough to pull three straight upsets and win another Super Bowl. 3 – Houston Texans – The Texans looked better in beating the Bengals 31-10 than they had in the final month of the season. QB T.J. Yates hit some plays down field, which had been missing in recent weeks. That’s essential if the Texans are going to be able to challenge the Ravens this week. The Texans’ defense, meanwhile, did a great job. That unit will need to play even better against Baltimore. The Texans will be undermanned against the Ravens, but they have enough pieces to pull the upset if they play at their best possible level. 1 – Denver Broncos – The Broncos pulled off the upset of wild-card weekend, beating the heavily favored Steelers 29-23 in overtime. The defense played better than it had in a December lull, and quarterback Tim Tebow obviously made some huge plays down the field. We were impressed by WR Demaryius Thomas, who seems to be growing into his immense potential. We still don’t think the Broncos can knock off the Patriots, but they gave their fans a great moment, and Tebow showed that he has the ability to continue to develop as a starter.